Another great weekend. Yes, indeed. 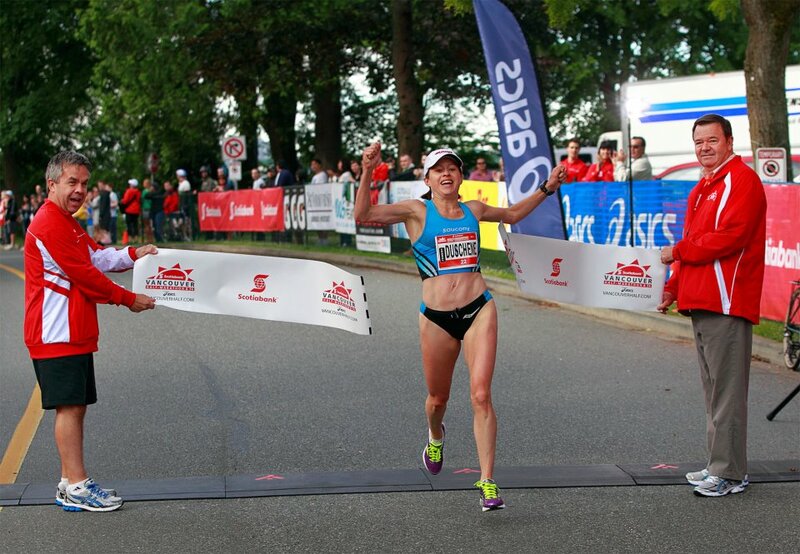 So, I flew to Vancouver for the weekend, to run the Scotiabank Vancouver Half Marathon. For some reason, flying to Vancouver seems like a long flight, much longer than to Europe. Strange. Anyway, Steve picked Eric, Reid and I up at the airport and drove us to the hotel (thanks again, Steve). As soon as I checked in and got to my room, I was reunited with Lanni. We hadn’t seen each other since our big Rotterdam race; it was great to catch up in person. After chit chatting and relaxing we headed down the street to Whole Foods. Boy oh boy that store is great. 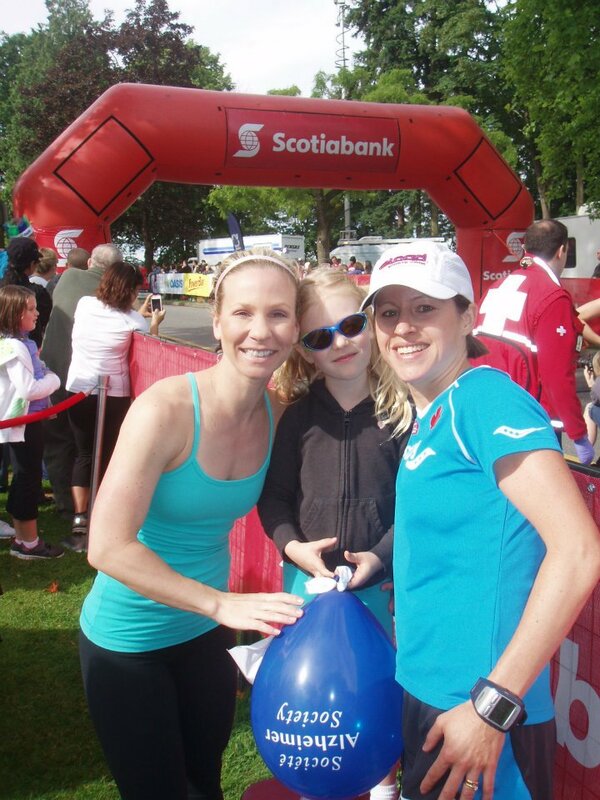 I first went there with my amazing friend, Stacey when in Vancouver to race the 2010 BMO Half Marathon. I think this dietitian could spend a good 2-3 hrs walking around that place. Lanni and I both got a spinach salad with bell peppers and….amazingly delicious maple-glazed chunks of salmon. Wow, was it ever great. We shared a loaf of whole grain bread and I grabbed a coffee to enjoy back at the hotel. Had a great sleep. It’s great to room w/ Lanni. We really do connect. Must be the fact the we come from big families (she has 6, I have 5 siblings) and a background on the ice (she figured skated, I played hockey)! Saturday morning we headed out for an easy 25 minute run along the Seawall. Beautiful, simply beautiful. I find that when I’m racing, I can’t always take in the amazing scenes around me so I was sure to enjoy the view during our easy run. Again, back to Whole Foods. I got some scrambled eggs, blueberries, and another coffee to have w/ our bread, peanut butter and honey back at the hotel. We relaxed again then got showered and ready to hang with Stacey and her 5 yr old daughter, B. She took us to….none other than Whole Foods (on Cambie St. instead of Robson St. again) where we had lunch. At this point Lanni and I were starting to focus more on just pre-race routine carbs. So we had a grilled chicken sandwich made w/ some pretty thick bread. We then headed to Thomas Haas chocolates. We enjoyed a tiny little square of delicious dark chocolate (and yes, another coffee for me) while chatting on the patio. It was a lovely afternoon (you must layer your clothing while in Vancouver, the weather changes every 15 minutes it seems), catching up w/ Stacey on life and talking about our running passion. 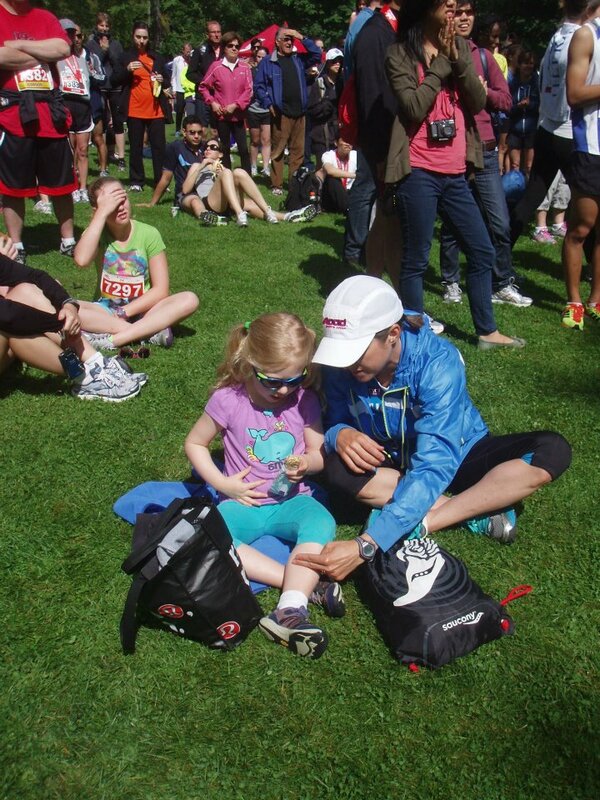 Around 3pm Lanni and I met w/ Alan Brooks to chat about … running. Although the chances of running in London for the 2012 Summer Olympics are slim (f.y.i. we are taking the final step of arbitration with the SDRCC), we have a pretty exciting plan B. Stay tuned! On the way back we saw a quaint little Italian restaurant so returned there around 5:30pm for dinner. Eating w/ plastic forks on your hotel bed can get a tad tiring. The spaghetti w/ tomato sauce that we each had was quite tasty and we were glad to get back to settle in at the hotel around 7:00pm. I like to eat an early dinner the night before if it’s an early start the next morning. Another good sleep. So, race day we were up at 5am and in the van at 6:15 to head to the start. We warmed up (2km or so) around the UBC track, did some stretching, used the “elite” portapotty a few times, stripped down to our racing gear then got the show on the road. It was my first time wearing bum huggers and a crop top. Must say that I quite liked it although I had to hold my 2 gels in my hands and tuck one in my top (I ended up only using 2 because I had sufficiently carb-loaded Friday and Saturday)! After the gun, I settled in to a relaxing pace that felt just right. I knew the first 10km were downhill so wanted to keep that in mind. You gain speed but want to be conservative, knowing the bridge around 18km can getcha if you’re not careful. Also, it’s harder on the legs and like the Hamilton Road 2 Hope marathon, once you get to level ground, it can actually feel uphill! Anyway, around 4 km I could see Lanni starting to fade back from her little group, which was slightly ahead of mine (including Darren Lee!). Then, I went past her and asked her if she was ok. She was not so dropped out. Fortunately it was later discovered that it was just a strain. I’m sure she’ll get into some water for some pool running to heal and be back at it in no time. That girl is tough. Rick and I had planned for me to run 3:30/km then go after whoever was in the lead later on. I kept this in mind the entire time, knowing the bridge at 18km was where I could make my move. After my Around the Bay Race this year, I knew I could tackle the hill. However, I was able to get past Kenyan Anne Jelegat with some decent strength around 14 km. I dug deep to get up the bridge then got to thinking…will I break the 1:14 as I hoped? With 2.1 km to go, I was somewhere between 1:07-1:08. I knew it’d be tough but picked up the pace and finished with a 1:14:02. So, the last 2 km’s were low 3:20/km. Sometimes you need to finish a few seconds off your goal time in order to keep the hunger there. I was ok with that. A PB by 1:40 is great. After a few pictures and interviews, I drank my Emend then headed off for a cool-down run on the trails with Darren and Lisa Harvey. For the afternoon, Stacey and Ms B took me back to their place and I had one of Stacey’s amazing smoothies then enjoyed a cup of coffee outside while Ms B played w/ her friends. Stacey and I can cover about 100 topics in a short amount of time so although our visit was short, it was sweet and productive!! I then went back to the hotel for a quick shower then headed to the airport w/ the gang again. Reid, Eric and I sat together on the flight back. It was nice to get to know them (Reid and I being Guelph grads, Eric and I being parents, etc.). I think they would have fallen over if they had been standing when they discovered Jonathan and I would like to have a 4th baby some day! I must say I had a fun time with them, joking about their fame, Reid getting busted with his peanut butter stash, and us nearly missing our flight. Jonathan picked me up at Pearson and I got to bed back in Brantford, around 2am. I took the morning off (I’ll do an easy 20 km later) and enjoyed a yummy breakfast w/ my kids followed by a few cups of coffee outside on the back deck while they played in the yard, all of us in our pj’s. I also had a nice chat w/ Coach Rick. Good times. So blessed. Loving this life God has given me. I love reading the "behind the scenes" details. That's the kind of stuff I find so interesting. I suppose I should qualify a bit – the excitement over whole grain bread and another health food store isn't my thing (drop me off at the book store or a yarn store), but a big sister has to have some things that make her a little "cooler" then her younger sister, I guess. 😛 Haha.